Married housewife and mother of two teenage boys, Angus (Kelly Mcdonald) is having an existential crisis. She has spent the last 25 years married to Louie (David Denman), a kind-hearted father and husband but one who is completely oblivious to his wife’s internal struggles and desires. Directed by long-time indie producer Marc Turtletaub (Little Miss Sunshine, Loving), Puzzle follows Agnus’ personal struggle as she tries to self-assess her future and cope with the anxieties of her marital relationship by becoming obsessed with jigsaw puzzles. Angus’ life is one of complacency. She spends the days tediously cleaning house, shopping, and attentively participating in her local church group’s social activities. Drifting aimlessly in the mundane space between depression and contentment, the film opens on her birthday where she receives two items that change the course of her life. The first, a smart phone completely overwhelms her; “Why can’t I just call them on my home phone like I’m used to?” she asks he children. The second, a 1000-piece jigsaw puzzle, which captures her attention almost immediately and sets her on a course to meet Robert (Irrfan Khan), a competitive puzzle-solving enthusiast. The two form an odd, but endearing relationship which serves at the catalyst for Agnus to begin questioning her constraining domestic life. Taking cues straight from indie-dramas playbook, Puzzle disappointingly is a bit too predictable in its narrative. While we might have seen shades of this movie many times before, Turtletaub brings enough power to the film though quiet, nuanced moments that begin to compound on one another as the film progresses (more drama is revealed through facial expressions of one particular moment where Angus examines herself in a mirror than can be found in any Marvel movie). Of course, a film like this would disintegrate if not for MacDonald’s stellar portrayal of an imperfect but still deeply likeable protagonist. She fits the role like a glove and brings nuance to her character even when the screenplay demands to be overly saccharine. Still, Puzzle is more that the sum of its separate parts, and the film manages to make a successful U-turn from its rocky first act into a nicely quiet and mature examination of a woman in crisis. All without any unnecessary chutzpah of high-stakes melodrama. Bottom Line: Though it leans a bit too much into its unearned sentimentality, Puzzle eventually embodies a subtle and affecting story about self-assessment complete with a superb performance by Kelly Macdonald. This final verbalized directive is given to a contract killer named Joe (Joaquin Phoenix) by New York State Senator Albert Votto (Alex Manette) halfway through Lynne Ramsay‘s brilliant You Were Never Really Here. It might as well also be Ramsey’s personal motto towards her audience. In her follow-up to the 2012 psychological drama We Need To Talk About Kevin, Ramsey again delivers a dark, emotional, powerhouse of a movie, lead by a foreboding performance from Joaquin Phoenix. The acclaimed actor is seen here bearded and brooding as a jaded hitman-for-hire living with his elderly mother in a NYC suburb. His presence is fearsome and physical; it’s obvious from closeups of numerous scars and Joe’s sunken eyes that this is a man who has endured numerous physical and emotional traumas. Ramsey keeps the plotting incredibly tight – very little is said to us upfront but the narrative table is set through a series of visual details. The ripping sound of duct-tape.. a bloody hammer.. Joe’s fingers tracing a small photograph before lighting the thing on fire. Most of the action in You Were Never Really Here takes place just outside of the cinematic frame, but we feel the entire ominous weight of its lingering brutality. Through it all, Phoenix stays poised but frantic, speaking mostly in mumbles and wandering through city streets like a shell of the person he once was. Joe is a someone who is becomes exponentially both delicate and brawny as the film progresses and he gets wrapped up in a seedy network of conspiracy and violence. Though there is very little dialogue in the film, You Were Never Really Here is anything but quiet, thanks in part to the anxious and bubbling score by Radiohead’s Jonny Greenwood. The film’s sound design is also noteworthy; small textual details like the grinding of a car engine or the brush of a towel against flesh are magnified. It’s a highly viceral film – one that’s deeply cynical and moody but always feeling alive and fresh thanks to Ramsay’s unique vision and directorial talent. The juxtaposition of various sounds, visuals, and textures leads to an immersive fever dream at points, and the the film’s knack for shifting between the world’s and Joe’s points of view is used with jarring results. 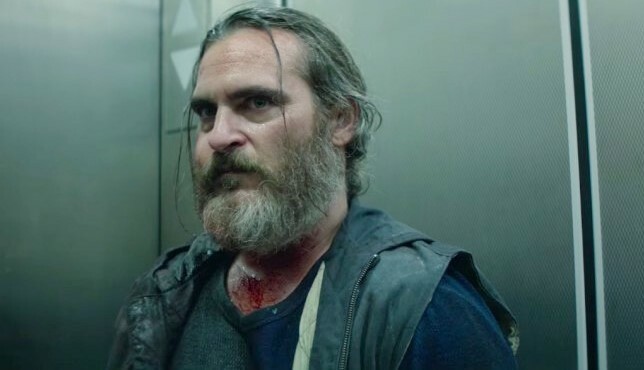 Bottom Line: Lynne Ramsay’s heavy display of a traumatized psyche in You Were Never Really Here is an artistically vibrant, immersive, and anxiety-ridden experience. Adapted from Jeff VanderMeer’s novel of the same name, Annihilation cements director Alex Garland as one of the most ambitious talents in contemporary sci-fi. Starring Natalie Portman, Oscar Isaac, Jennifer Jason Leigh, Tessa Thompson, and Benedict Wong, the film tells the story of Lena and Kane (Portman and Isaac, respectively), a military couple who become caught up in investigating a government-restricted ecological disaster zone titled “Area X,” where a series of mysterious events have been puzzling authorities for the past several years. Things go from bad to worse as Lena, a microbiologist by trade and academic by profession, gradually discovers the horrific details of failed missions designed to mine Area X for clues explaining its perplexing nature. Alex Garland, who previously wrote and directed 2015’s superb techno-thriller Ex Machina, displays much more confidence the second time around. As with his first feature, Garland plays heavy into big philosophical ideas about the nature of mankind, only now things feel bigger, less sterile and more experimental. In the film’s first half, you get a strong sense that individual scenes have a chimerical and visionary purpose to them, one that gradually builds up to overwhelming feelings of anxiety and dread. There is a slow, meditative transition from fantasy towards nightmare in Annihilation, as characters slowly realize – along with the audience – that things in the environment aren’t quite right. Though most of the film is subtle in its examination of psychological unease, parts of the film’s latter half go into full-bore survival horror with surprisingly effective results. Performance-wise, almost everyone is solid with Garland’s script, and thankfully many of the scientist-type movie tropes are left aside. Isaac, who previously starred in Ex Machina, is fantastic and Portman might be even better. The weak character moment comes with Jennifer Jason Leigh – an actress I’d long associated with energy and flamboyance – playing Dr. Ventress, the subdued and jaded government psychologist who is supposed to be seen as some sort of character foil to our emotionally-driven protagonist. Even more out of place is the film’s bizzare score which mixes subtle synth-work with… folksy blues guitar? Whatever shortcomings the film has on the audio side are more than made up for with Annihilation‘s unique visuals which, at times, boast some of the best sci-fi production design and visual effects since Under the Skin. Garland has obviously shifted away from the science-based, tech-conscious realism of Ex Machina towards something more transcendental and abstract. While I think I would have appreciated it if the film were more grounded in its dialogue, the story is wildly imaginative and itches that sweet spot in a way that only great cinema can. Annihilation is a terribly ambitious film that was designed to inspire – and it hits the right notes more often than not. Bottom Line: Annihilation feels a bit too weighted in fantasy rather than the gritty realism it’s aching for, but the film’s atmosphere, visuals, and ambition prove director Alex Garland has raw talent for telling engaging, thought-provoking sci-fi.